~ Man and his will to survive! BLAST-Basic Local Alignment Tool was born in the 1990s (1,2) and has since been the bread and butter of homology searches (sequence similarity in large databases). Having said that, I would not like to discredit similar tools such as WU-BLAST, FASTA etc. I recently came across and read with great interest a wonderful paper from Baldi and Benz (3) highlighting the possibility of using this tool to fish out similar chemicals from databases. It touches upon a few statistical challenges and adaptations of Tanimoto scores for calculating the similarity of molecules. There are various ways for calculating chemical similarity i.e. graph based, fingerprint based etc. In today’s blog I will discuss using fingerprint based similarity methods to calculate similarity between molecules and how we can use this for BLASTing small molecules. The wiki has a rich page dedicate to the BLAST Tool. Calculate chemical fingerprints (binary: true, false) for a given molecule for size length L.
Choose the indexes in the L which are set to true (for example, if bits 1, 10, 30,…. etc. are set as ‘true‘). Concatenate the patterns to form a sequence (B$BA$DA$…). While searching transform them as byte array and match them (treating the byte until $ as one letter). Create HSP tuple patterns and align the patterns using the BLAST algorithm. Here it’s a basic/crude step towards an un-gapped alignment search which is fast yet powerful enough to bring out significant pattern matches between fingerprints sequence arrays. In order to test the performances of the method I have chosen ChEMBL-19 dataset containing ~1.4 million molecules. a) Preparing the ChEMBL-19 database for BLAST search by calculating HSP regions from fingerprints. Note: This step is only required if a new database is released. I have used ECFP4 (CDK CircularFingerprint). Parallel implementation of BLAST search achieves 4X speed improvement, allowing gapped alignment for better coverage of hits. b) Performing chemical similarity search on ChEMBL database. 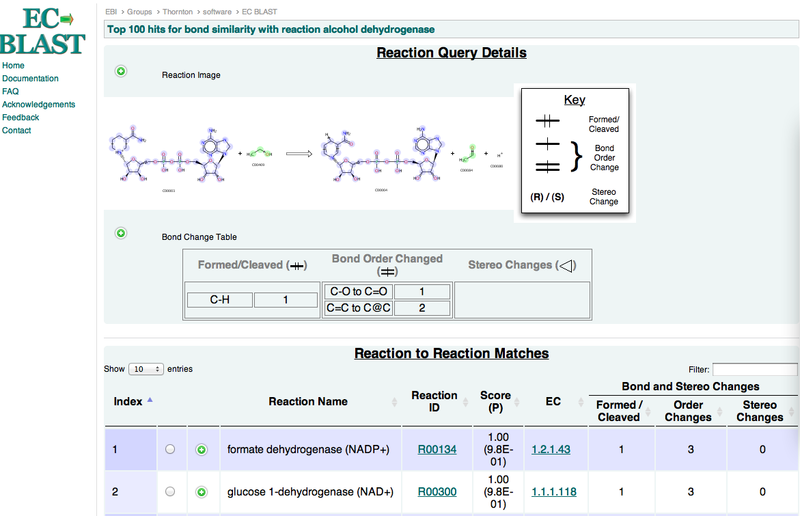 I have chosen the query example selected by Andrew Dalke to test his chemfp-1.2 tool. Running Time: 70.36 sec, 11808 hits found. 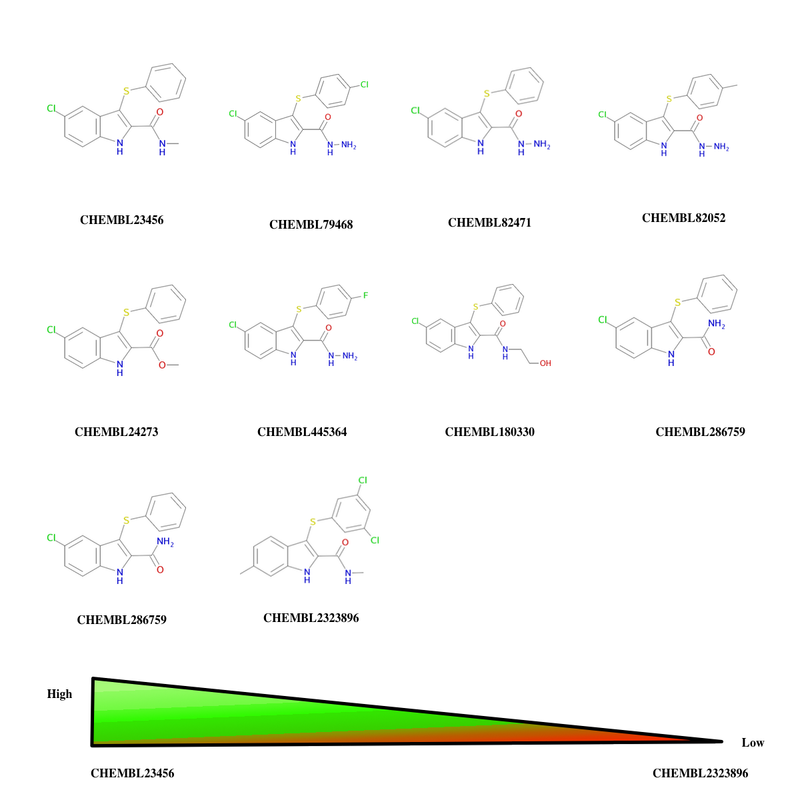 Top 10 ChEMBL-19 hits reported by ChemBLAST tool for query molecule CHEMBL23456. Top 5 hits from Andrew Dalke‘s test case. Thanks to John May, for providing the top 5 chemfp hits using the CDK ECFP4 (makes it an even playing ground as we both use the same fingerprints). We all agree with the top hit CHEMBL23456, but we differ on the remaining top 4 hits. This could be due to the variation in choice of our fingerprints/methodology. Nonetheless, the top hits in both the cases looks interesting. I am sure there are many ways to reach the same goal and further optimisation of the code will make it even more attractive. Needs more playing around with! The ChemBLAST– tool is freely available on the GitHub for you to play with and its reasonably fast. a) It tries to compare gene sequences (amino acid or nucleotide) – query string against target string. BLAST will find conserved patterns in the database which are similar to sub-patterns in the query. The statistical parameters and are estimated by fitting the distribution of the un-gapped local alignment scores of the query sequence and a lot of shuffled versions (global or local shuffling) of database sequence patterns, to the Gumbel extreme value distribution. c) W: Word/Pattern size – find W-mers (like n-grams) in target/query, T: Threshold – focus on pairs scoring >T, X: Drop-off – stop extending when loss > X, S: Score – the final score of segment pair. Conditions: If W is too large, it will lead to too many patterns in L and vice versa – if too small, it will lead to too few patterns. If T is too large, then it’s very stringent (conserved blocks) and if too small, it will lead to too many extensions. Look for High-scoring Sequence Pairs (HSPs)-tuples and choose cut-off for relevant hits. d) Find high scoring pattern of length W, and compile a list L of all W-mers that score >T with some pattern in query sequence. Then scan database for words in L and each positive hit is matched and extended. When score drops more than X below hitherto best score, stop extension. Now report all words with large score S.
1) Altschul SF. et.al. Basic local alignment search tool: J Mol Biol. 1990 Oct 5;215(3):403-10. 2) Altschul SF, et al. Gapped blast and psiblast: a new generation of protein database search programs. Nucleic Acids Res. 1997;25:3389–3402. 3) Baldi P. and Benz RW. BLASTing small molecules—statistics and extreme statistics of chemical similarity scores: Bioinformatics. Jul 1, 2008; 24(13): i357–i365. Enzymes have been part of our evolutionary machinery and it’s importance is ever increasing in our life. An enzymatic hierarchal functional classification has been developed to cluster similar enzymes based on its chemistry (kindly refer to my previous blog on enzymes). A parallel system envolves sequence and protein structural based classification systems. One of the most challenging issues in todays bio/chemo informatics science is to automatically link the sequence knowledge with the enzymatic chemistry. There exists many methods in the literature addressing this issue but its hard to find a direct link which can hold true for all the cases. Although, very recently in the Prof. Janet Thornton’s group we have come up with a web tool – “FunTree” for linking enzyme super families based on the knowledge of the evolution, derived from sequences and structures (proteins and small molecules). It’s very enigmatic to find a one to one mapping between genes->protein->enzymes and its equally mind boggling to navigate in this space. This is one of the reasons why we have many orphan enzymes or enzyme which do not have a sequence assigned to it yet. On one hand we have ever increasing sequence database and sophisticated tools like BLAST and FASTA to compare them. Unfortunately, the bio-chemical side of the story is slow as we have limited number of publicly available chemical databases and tools in chemistry. Although in the recent years there has been databases like BRENDA, KEGG, BioCyc, UniProt, EC->PDB and SwissProt etc. to bring forth and link sequence to chemistry. There are efforts to link up various resources of enzyme chemistry under an umbrella and one such web portal is “Enzyme Portal“. Likewise there exists, few curated databases linking enzyme function and reaction mechanism like MACiE , Rhea and SFLD etc. The challenge for a biologist/chemist is find a tool which can function like BLAST (as a magic black box) in finding similar enzymes in a reaction database (needle in a haystack). The good new is that we have made some progress in this interesting area of research by coming up with a novel tool – “EC-BLAST“. The core idea behind this tool is to find similar enzymes ranked by similarity of the bond changes, reaction center or chemical structural similarity of the participating reactions. One could start a search with a molecule/reaction name or its structure. The Atom-Atom Mapping (AAM) is algorithmically generated on the fly for a balanced input reaction and the bond changes are automatically deduced and marked before performing any search. The cognisance of search results would channelise us to gain better insight into the catalytic promiscuity of the enzymes and complement the sequence based results obtained from tools like BLAST, FASTA etc (where the chemistry in not necessarily retained in the results). This will help us to link up the evolutionary and mechanistic aspects of the enzymes, in the biological findings with chemical knowledge. Such tools will also help us gain better insight into toxicity studies (can be a value added parmeter to the likes of ChEMBL/DrugBank), in designing novel enzyme and retrosynthetic pathways etc. Although the first glimpse of the EC-BLAST was unveiled at the ISMB 2011, Vienna where it won the “Killer Apps 2011” award, it largely remained restricted to the EBI and collaborators. The response at the ISMB 2011 (poster here) was very encouraging for us and there has been an ever increasing need, scope and requisition for such a resource. Hence, we have now decided to go public with a beta version of our web portal service. 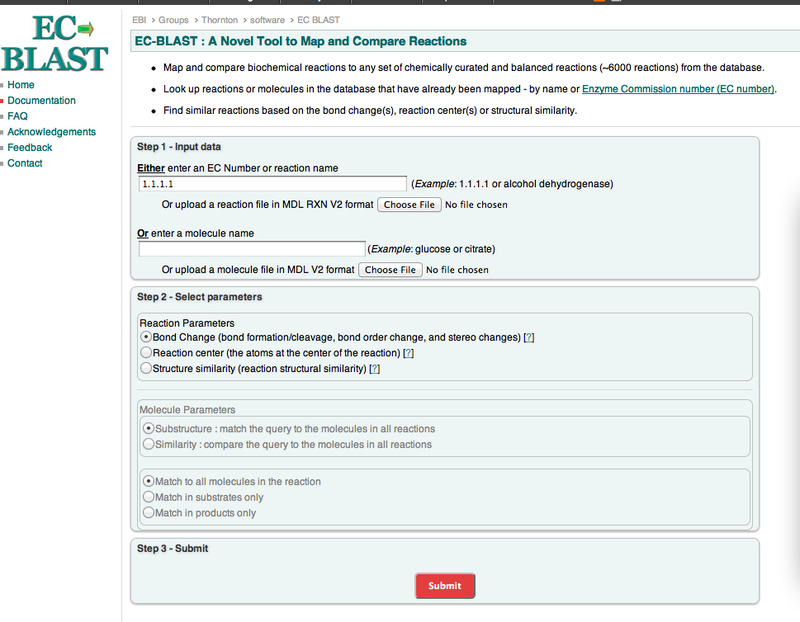 EC-Blast result page for bond change similarity searches. Note: If you are interested in testing this service or sending us your comments or feedbacks, please do let me know! A Romance between Biology and Chemistry - Protein Sequences, Molecules and Enzyme function!